One of the best things about being British is that eccentricity is not just acceptable, it’s almost compulsory. It’s perfectly possible to run the London marathon dressed as a tampon or to sail across the Atlantic on a sofa and still be considered entirely sane and almost normal. I say “hoorah to that” and the more such activities the better though I’d really rather someone else does them so that I don’t have to. When I read that two young women had driven a bright pink tuk tuk (auto-rickshaw) overland from Bangkok to Brighton to raise money for charity, I knew that I would have to get a copy of their book and find out more. 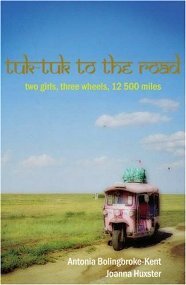 That book is Tuk Tuk to the Road: Two Girls, Three Wheels, 12,500 Miles by Antonia Bolingbroke-Kent and Jo Huxter.